PulpFest 2013 gets underway on Thursday, July 25th and the whole Age of Aces crew will be in attendance. 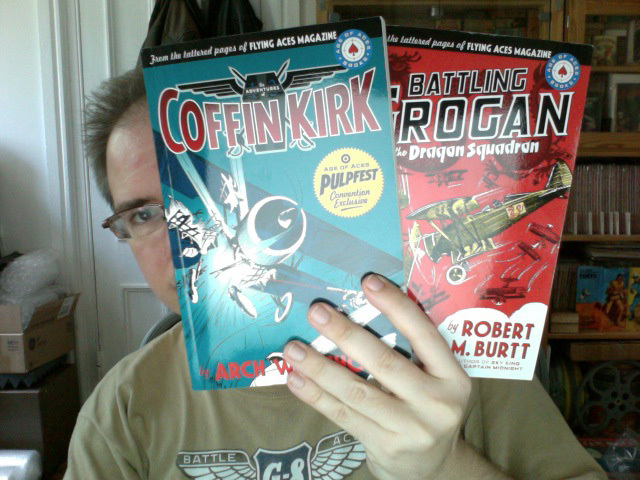 We’ll be promoting our new book—our biggest yet—Battling Grogan and the Dragon Squadron. “Battling” Grogan is an American flyer in command of the Chinese Dragon Squadron fighting to repel the invading Imperial Japanese. The stories are written by Robert M. Burtt who is probably best known as co-creator and writer of such radio classics as The Air Adventures of Jimmie Allen, Captain Midnight, and Sky King. Since we wouldn’t have the third Philip Strange book ready in time for the convention, we decided to try to get together a special book just for sale exclusively at the convention. In looking around at what we had scanned and ready to go, we hit upon Coffin Kirk by the prolific Arch Whitehouse. These six stories of Coffin Kirk and his trained-gorilla tail-gunner Tank and their fight against “The Cirlcle of Death” were available in our Age of Aces Presents section a few years ago. We removed them when we were intending on releasing them as an eBook online so it seemed only natural to put them out as a print book. We had initially planned to offer the book only at the convention, but we thought we’d make it available on Amazon for the week of the convention for those who can’t attend, but would still like to pick up a copy of the book. Art Director Chris Kalb show off our two new titles. So stop by our table and meet the crew and check it out or pick up any of our other titles at special Pulpfest discounts. If you can’t make it—keep your eyes on ageofaces.net to find out more about our new books. And hurry over to Amazon where, for a limited time, you can pick up a copy of The Adventures of Coffin Kirk! Battling Grogan and the Dragon Squadron are here! After a bit of a break Age of Aces is back with our biggest book ever! 470 pages big! We have posted a few of The Battling Grogan stories a number of years ago and thought they we so great we set about to collect all 14 of the stories and put them together in one big volume. The stories are set in China between the wars when Imperial Japan was trying to make inroads on China. Battling Mordray Grogan is an American pilot who leads the Chinese Dragon Squadron. He’s ably assisted by his three valiant flight commanders, Monty St. John, the lanky Limey, slender Hank Goyen, the dapper Frog, and last but not least, the imperturbable Ah Im, Grogan’s boyhood chum of old Nanking days, now premier olive-toned ace of the Dragon clan. 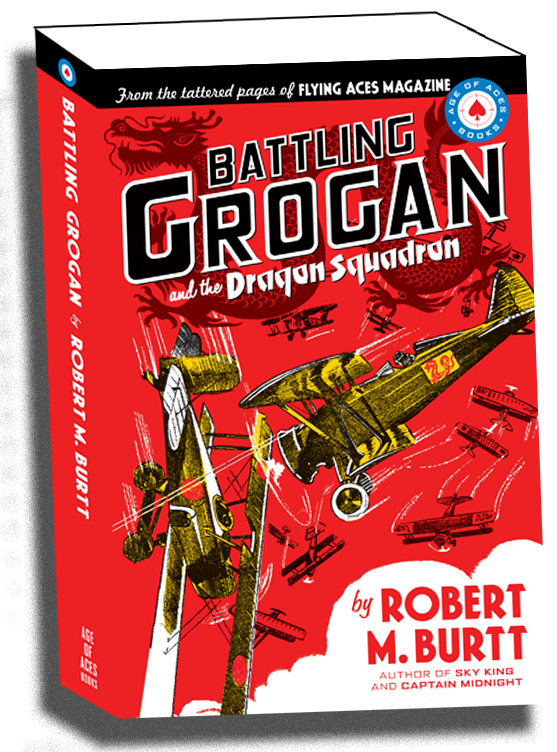 Battling Grogan is the brainchild of WWi pilot Robert M. Burtt who wrote the 14 stories between 1932 and 1934 for Flying Aces Magazine. Burtt is probably best know as the co-creator and writer of aviation-themed radio serials The Air Adventures of Jimmie Allen (1933-37), Captain Midnight (1938-49), Hop Harrigan (1942-48) and Sky King (1946-54). So click on the book image above or cruise on over to Amazon and check out our latest release!